Private Burgundy mini-tour package includes: Private transportation and English speaking tour guide, services of you guide, cost of standard wine tastings, taxes, tolls and parking. Not Included: Hotel, train tickets to and from Paris, entrance fees, meals, special tastings you decide to include. NOTE: We will purchase the train tickets for you ahead of time. In the morning of your first day in the Burgundy countryside, you will tour the historic city of Dijon, with its well-preserved medieval center and marvelous mansions. 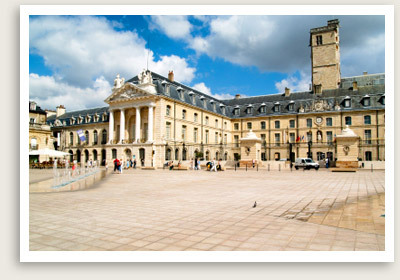 You will visit Dijon’s picturesque marketplace, where you may pick up some farm-fresh treats. Your expert Burgundy guide will also have suggestions for a lunch stop. You will return to Dijon, where you will spend the night. Today your Burgundy private tour will focus on Côte de Beaune. You will start the morning with a tour of the Hospices de Beaune, a famous Beaune landmark. Adorned by colorful diamond-patterned tiles, the Hospices de Beaune was founded in 1443 as a charitable hospital. The original building, Hôtel Dieu, is now a museum, which you can visit on your tour. Your guide will have suggestions for lunch. Later you will explore the Hautes Côtes de Beaune, whose family vineyards have been making wine for 15 generations. The scenery here is spectacular: the villagers’ homes seem to cling precariously to the steep cliffs of Orches. You will then visit to a winery for wine tasting in Savigny-les-Beaune, a small town producing mainly red wines, including 22 Premier Crus. You will nxt visit another winery in Meursault to enjoy some of the fine Chardonnays produced here. Finally, your private tour of Cote de Beaune will take you to enjoy Chassagne Montrachet, called one of the “Big Three” white wine-producing villages in the Côtes de Beaune. You will be taken back to your hotel or to the train station, depending on your plans after your time with us.